The decision of the British Treasury to get tough on tax breaks is not crazy, but smart and balanced. Because they are sure that money and foreigners are not the only resources to bring prosperity and development to London as well as England where a mix of dignified tradition and forward-looking openness to the rest of the world with advanced democracy has been fascinating big cash and celebrity from the parvenu Russia, the Gulf states and Asia recently. So they balanced the people of England with those from abroad, reacting to the criticism on tax breaks for foreigners from inside the country. 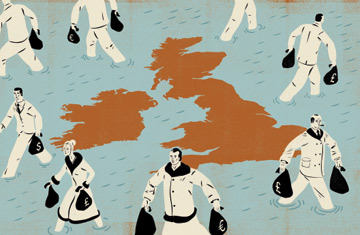 In fact, the other major tax havens as Switzerland, Isle of Man, Luxembourg, Singapore and Hong Kong have been attracting more overseas big money than London with the direct tax break incentives such as the secrecy of privacy in Switzerland rather than with the various charms of the country by itself. Thank you for writing. We welcome timely, insightful reactions to material we have published, and we can assure you that your observations found an attentive audience among the editors. If your comments are selected for the Inbox column, you will be notified in advance of publication. Again, our thanks for letting us hear from you. We hope that you will write again should you discover something of particular interest in the news or in our reporting of it.